It’s winter and as the weather gets cold outside you want food that is warm on the inside, food that’s gonna stick to your ribs. Which begs the question how does food stick to your ribs? I don’t know, I’m not a doctor. But I know a thick rich soup or stews or gumbos is going to fortify you and stick with you. Although there are countless ways to make gumbo there are certain constants. In the Georgia Mountains deciding what variation of gumbo to make was simple. You’re not going to find any fresh seafood at the local Ingles. And you are not going to make Gumbo with frozen seafood. Might has well by a frozen dinner and heat it up. Chicken and sausage are more forgiving and easier to find here in the mountains. You can even get organic chicken, hey, we’re not savages. The best chicken part for anything made in a pot is the bone-in skin-on chicken thighs. They fit so nicely together and the flavor and tenderness is the best. But I couldn’t get a package of thighs not even the factory chickens. So I settled. I’m using for skinless, boneless breasts. See my notes on using chicken thighs below. Some people would say the roux is the most important part of the gumbo. Some people would say, what’s a roux? A roux is a mixture of flour and fat used as a thickening agent. In French cooking, roux is usually made with butter and flower in equal parts. It is only cooked for a couple of minutes to remove the flour taste. Adding milk to the roux creates a basic béchamel or white sauce. Adding stock to the roux and you got yourself a veloute. In Cajun cooking the roux is much more than a thickening agent. It’s a signature, a source of pride. The longer you cook the roux the darker and richer it will become and of course this will effect the color and taste of the finished product. The richest and most flavorful roux is one that is cooked until it is a deep brown / chocolate color and the aroma in the air is that of roasted nuts. Also when making a dark roux you may want to use a higher percentage of flour to oil. Getting the right color can take a good 40 minutes to an hour. It is for this reason that you use oil not butter, unless you’re using clarified butter, whole butter has milk solids that will burn and that is not the flavor you want. I realize for some people okra is a deal breaker. They just can’t get past the slime factor. As a kid my only exposure to okra, ironically was Campbell’s chicken gumbo soup …with that single wheel of okra floating in your bowl. That’s all I knew or cared to know about okra. In a large enameled cast iron Dutch oven or large pot, heat 1 tablespoon of the vegetable oil over medium-high heat. Add the sausage and cook until well browned, about 8 minutes. Although my sausage was precooked I wanted to brown it anyway because I wanted to add another flavor layer. Remove the sausage with a slotted spoon and drain on paper towels. Set aside. Press the chicken breasts into a packaged Cajun spice mix or make your own, I used the Coaches Special Low Country Recipe. Cook the chicken over medium-high heat until well browned, 5 to 6 minutes. Remove the chicken from the pan, let cool, and then refrigerate uncovered until ready to use. Depending on how burnt you pot looks you may need to clean it before starting the roux. I’ll sometimes deglazed the pot with some dry vermouth and save the liquid to add back into the pot later. I was too lazy to do either so I just Combine ½ cup oil and a ½ cup flour in the same Dutch oven over medium heat. Remember if you want to make a draker roux, add ¼ to ½ cup additional flour. Cook, stirring slowly and constantly for 20 to 30 to 40 minutes. Not only do you have to watch the pot, you have to continually stir the pot. When you decide the roux is finished, add the celery, onions, bell pepper and smashed garlic. cook with the roux, stirring, until wilted, 5 to 6 minutes. Add your spices. Again you can add some store-bought mix or make your own. A lot of spice was already on the chicken from the Coaches Special Blend but I added to the pot some thyme, oregano, smoked paprika and a couple of bay leaves. I’ll hold off added the salt until I know how much salt is going to be released from the sausage. Add cayenne to your taste remembering that not everyone likes or can eat hot foods. Add the reserved sausage back to the pot and mix everything together and then stirring slowly add the chicken stock, until well combined. 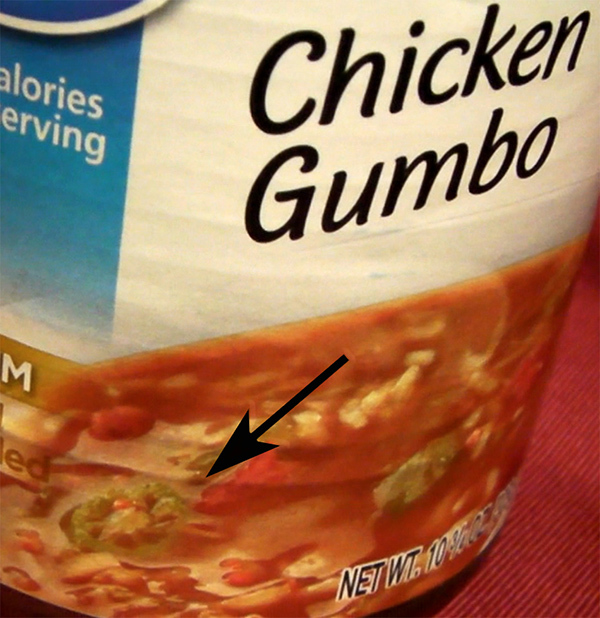 Add additional stock if the gumbo is too thick for your taste. Remembering also that if you’re using okra this will also thicken the gumbo. Bring to a boil lower heat and cook about 30 minutes. Add the sliced okra bringing the mixture back to a boil, then again reducing the heat to medium-low and cook, uncovered and stirring occasionally, for another 45 minutes to an hour. Cut the breasts into 1 inch cubes and Add to the pot and simmer for up to 1 to 1 and 1/2 hours. At this point the longer you cook the gumbo the more it will reduce and the more concentrated the flavors and the thicker. However, once you add the cubed chicken breasts make sure to keep the temperature below 180 degrees. You do not want to boil the chicken as it will get too tough. The safe internal temperature for all poultry is 165 degrees. Total cooking time once the stock is added is about 2.5 to 3 hours. You can shorten this time as long as vegetables are tender and the chicken is cooked through. Pull a chicken cube out of the pot and cut in half. If there is any fleshy meat showing your chicken is under-cooked. Put it back into the pot. Right before serving remove and discard the bay leaves, stir in the file powder, parsley and green onions. Ladle the gumbo over rice placed in the bottom of deep bowls or large cups and dig in. Season the chicken with the Cajun spice and add in batches to the fat remaining in the pan. Cook over medium-high heat until well browned, 5 to 6 minutes. Remove the chicken from the pan, let cool, and then refrigerate until ready to use. 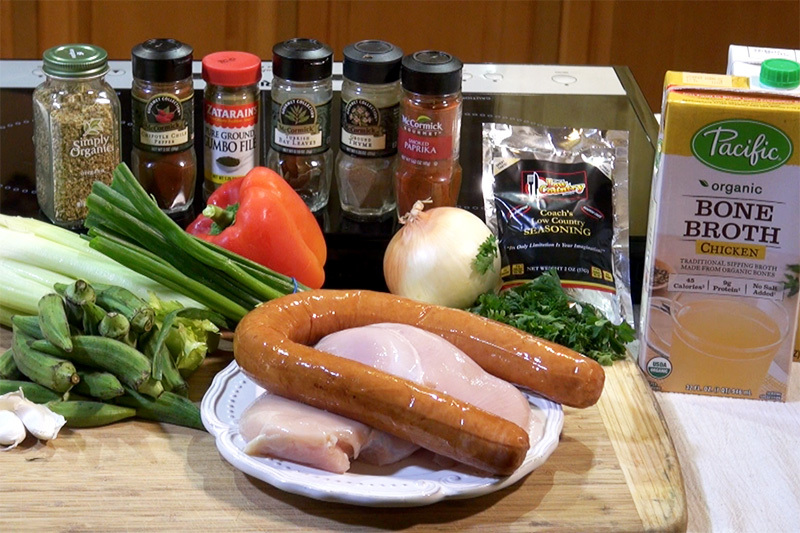 You’ll return the chicken to the pot after the vegetables and sausage have been cooked for about an hour. You’ll want to cook the thighs for approximately 1 to 1 1/2 hours checking the thighs to make sure they are cooked through. Internal temperature between 165 and 180 degrees. 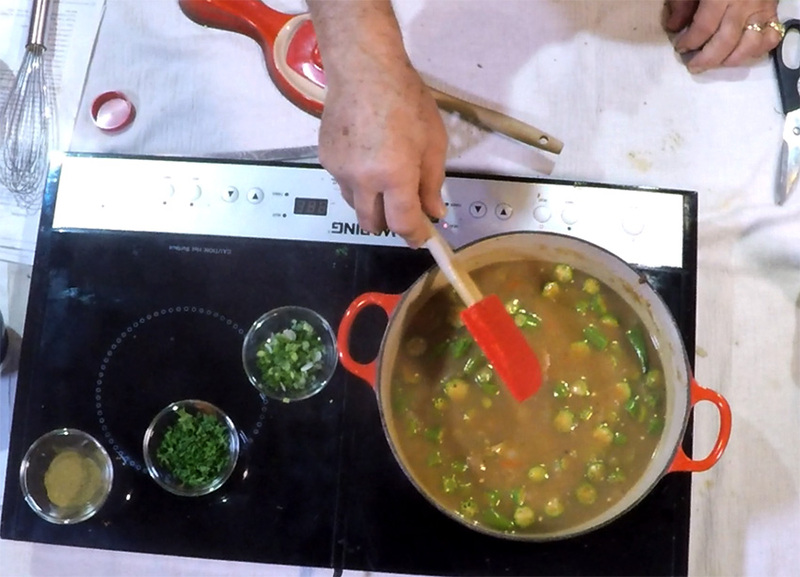 Using a slotted spoon, remove the chicken thighs from the gumbo and place on a cutting board to cool slightly. Pull the chicken meat from the bones and shred, discarding the bones and skin. Return the meat to the gumbo and stir in the green onions, parsley, and file powder.